THRIVE Young Adults is the community of Young Adults at Lifechurch. We exist to empower the emerging generation of influence, in every sphere of life. Whether you’re studying or a young professional. Whether you call Palmy your home or have recently moved. Our heart is to spur you on to build a greater personal relationship with Jesus and his cause. Talk to one of the pastors or team at Lifechurch before/after service this Sunday to get connected into a Life Group and to meet our awesome leaders. For more info on THRIVE Young Adults including gatherings and events, follow us on Facebook and Instagram. 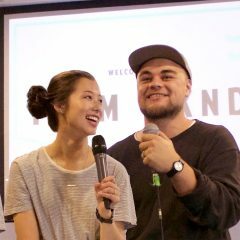 Zion and Sophie are the Youth and Young Adults Pastors of Lifechurch Palmerston North, with a heart to see the young people of Manawatu realise their full potential in God. Both futuristic by nature, they are inspired by what God can do and the possibilities ahead in every aspect of life. Zion is passionate about building the local church, everything leadership and Manchester United. While Sophie loves to spend her time on innovative creativity and finding things and places to re-style. Together, they oversee THRIVE Young Adults and THRIVE Youth, Sophie is also the Creative Coordinator of Lifechurch.